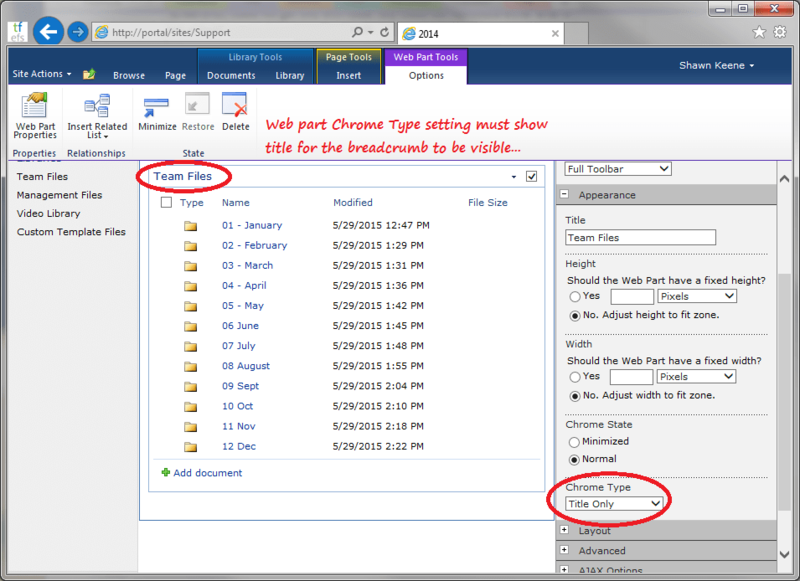 Inexcusably, SharePoint has no true breadcrumb navigation. In document libraries, navigating up and down the folder hierarchy is a painful series of pageloads. Fortunately, there are options. If you have access to the server, you can create a custom code solution in SharePoint Designer or Visual Studio and serve it up. But before devoting resources to a server configuration change and all that entails, there’s a client side option that’s much easier to implement, and a user by the name of alexisnomine has done just that. The modified web part title now includes a link to each level in the folder hierarchy leading to the present view. PS. Check out alexinomine’s other Gists for great code snippets. With this inspiration I will be setting up a similar repository, look for the link soon.